Sending back the first pictures of our roasted micro- lot of Panama Esmeralda that we won in the May 22nd auction in partnership with Batdorf and Bronson. As it turns out, I couldn’t taste it. The night before we left for Olympia, my 2 week cough turned into one of my worst colds EVER. Have you ever had the experience of flying with a really awful cold? A travel experience I will remember for a very long time if not the rest of my life. 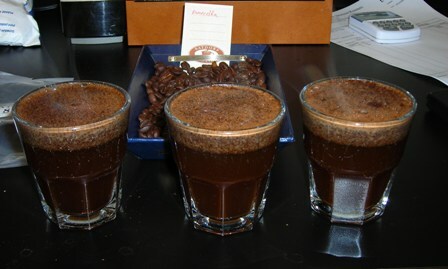 However, the folks sitting around the cupping table today were saying “WOW” a lot. 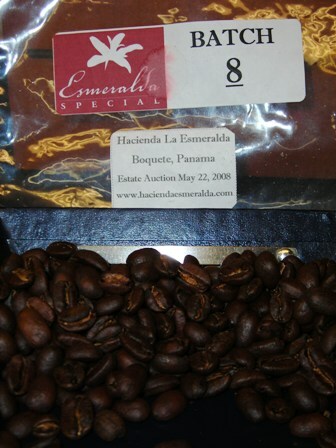 At the end of the day Oliver handed me a small bag of roasted Esmeralda to take back to Pittsburgh. I think there is probably enough to make a French Press or Chemex. I can’t wait. Oliver and I spent a couple of hours in the espresso lab learning some new espresso techniques. Tazza D’Oro baristas – more fun to come! Amazing day and somehow my cold felt better walking to the Oly Market on a chilly day. The flowers here are amazing. It’s hard to miss the sun with the emerald green of the grass and trees and the vibrant colors of all the Northwest flowers. During lunch we sat out over the bay and had the chance to watch a seal swim by with a flock of Sea Gulls in tow. Tomorrow we make a road trip to Seattle for an espresso bar crawl. The rest of my pictures from today can be viewed by clicking here. Immediately upon reading your opening, I could actually feel my eardrums getting ready to explode. Thanks for that memory! Hope you feel better so you can enjoy the rest of the trip and taste some good coffee.